Shakespeare’s Richard III was the role that launched David Garrick’s career in 1741. He was portrayed as the ill-fated king by several artists, including Hogarth. This portrait is based on the 1759 production at Garrick’s Drury Lane theatre. 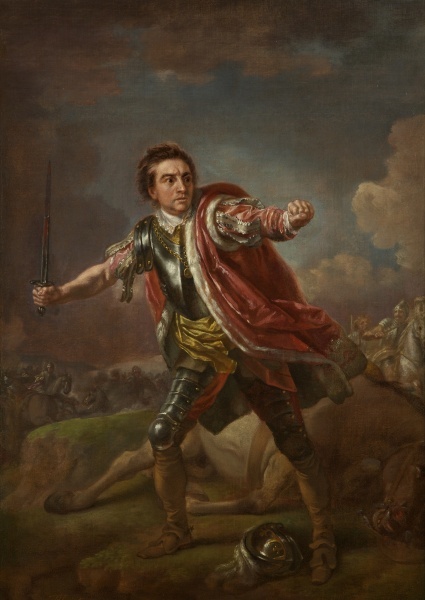 Hayman, a friend of the actor, has depicted him at the climax of the Battle of Bosworth, as he offers his ‘kingdom for a horse’. Hayman exhibited this painting at the first exhibition of the Society of Artists in 1760.